The Winooski River runs high along Route 2 through Richmond on July 19. So far in 2015, more than 1.5 million gallons of sewage and stormwater have flowed into the state's waterways in 15 authorized overflows. From May 30 into June 1, more than a million gallons of sewage and stormwater from the Vergennes sewer system flowed untreated from a pump station into Otter Creek. The mix of human waste, household discharge and street runoff poured into the creek intermittently for 31 hours with no public notice until a day later, when town officials informed state regulators of the overflow. The overflow was a consequence of the Vergennes sewer system design. Known as a combined sewer system, it uses the same treatment facility to treat waste water – all the water that goes down a drainpipe or toilet inside homes and businesses – as well as stormwater runoff. This means waste water mixes with stormwater going down storm drains in the streets, and all of that polluted water is then processed at the same municipal plant. Sixteen municipalities in Vermont have combined sewer systems. And while the Vergennes overflow was exceptionally large, overflows that put sewage into the state’s rivers and lakes are a regular occurrence. “Back in the day, in the '70s and early '80s, that was sort of the design engineering standard for constructing sewer systems, and as a result, older systems – those in the Northeast, those in the central part of the country, the upper Midwest, and even out in the Pacific Northwest – a lot of systems were built this way,” says Pete Laflamme, the director of Vermont’s Watershed Management Division within the Department of Environmental Conservation (DEC). The systems are designed to overflow when there’s heavy rain. Events like the one in Vergennes are allowed by regulators. Despite the risk to public health and impacts on water quality, communities downstream from overflows are not actively notified, and most overflow reports never make it past an obscure page that is three links deep on the DEC’s website. Sixteen municipalities in Vermont have combined sewer systems. And overflows that put sewage into the state's rivers and lakes are a regular occurrence. 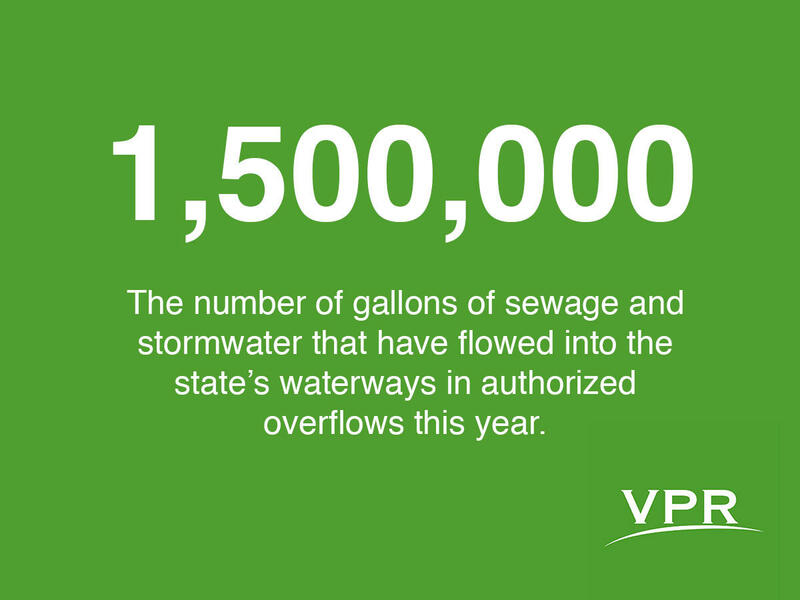 So far in 2015, more than 1.5 million gallons of sewage and stormwater have flowed into the state’s waterways in 15 authorized overflows. That’s more than 30 times the volume of water released in authorized overflows during the same period in 2014, when 42,622 gallons were released. For scale, 1 million gallons would fill a swimming pool 50 feet across, 10 feet deep and 267 feet long. The overflows are a tiny portion of the overall volume of water treated by the state’s combined sewer systems, and wastewater plants in general make up just 3 percent of the state’s polluting phosphorus contribution to Lake Champlain. Still, the legal dumping of sewage into waterways upstream from swimming areas and boat launches raises questions. For Ehlers, these overflows are simply a matter of communities being unwilling to make needed investments to separate their sewer systems from stormwater systems or to at least expand the capacity of existing combined sewer systems to prevent overflows. State regulators, for their part, are on board. There’s been a quiet effort for years to eliminate combined sewer systems and reduce their overflows in the state. The state has made significant progress over the last quarter-century, Laflamme says. In 1990, he said, there were about 171 combined sewer overflow points – those “safety valves” he mentions – across 27 different municipalities. Now Laflamme says there are 60 overflow points in the state across 16 municipalities. Developed land – which includes all paved roads, parking lots and other impervious man-made surfaces – makes up 13.8 percent of the state’s phosphorus contribution to Lake Champlain, more than four times as much as wastewater facilities. And when they’re not overflowing, combined sewer systems are cleaning the dirty runoff from paved surfaces before it goes into local waterways. While separating sewer systems reduces the risk of human waste ending up in waterways, communities risk doing more harm to Lake Champlain and other water bodies by introducing excess phosphorus to the water supply through street runoff. That pollution must be addressed in order for separate sewer systems to help Vermont’s water quality problems. Efforts to reduce polluted stormwater from flowing into waterways mostly consist of slowing the water down. Retention ponds, wetlands and vegetated ditches allow the stormwater to seep into the ground during storms, instead of running directly into rivers and lakes, carrying pollution with it. Whatever the solution – expanding capacity of a combined sewer system so it can handle heavier flows or separating the sewer system – improving water quality is costly. Officials say there isn’t much money at the local or state level to support the changes. DEC Commissioner David Mears says the state uses a permitting policy to require municipalities with combined sewer systems to have a plan to separate stormwater. The state has no money to offer communities that want to upgrade their combined sewer systems, but it does enforce standards. Any work done on combined sewer systems in Vermont must bring them towards the goal of being able to handle what’s known as a “design storm” with no overflows. Those standards are about to get tighter, Laflamme says. “We’re in the process of updating that CSO policy as well, where we’re going to be raising the bar, if you will, we’re going to be increasing the design storm that these systems have to be compliant with, both in terms of overall duration and frequency, but also the intensity values around that. So we’re doing that work and we’re also requiring additional green stormwater infrastructure” to reduce the total amount of water that comes into combined systems during rainstorms. But even as the state works to increase systems’ tolerance for storm events, only about 30 of the 60 overflow points can handle the current design storm. When the standards get tighter that number will likely fall, and the state doesn’t have money to give municipalities for improvements. That investment has been hard to come by. Many communities have sewer systems that date back to a surge of federal funding that came with the Clean Water Act in 1972 and have seen little investment since. The cost of building wastewater treatment capacity has simply never been in the local budget, Ehlers says, and local communities aren’t faced with the costs associated with not making that investment. There have been 25 sewage discharges in Vermont in the last 35 days. Many of these discharges were what are known as "combined sewage overflows," where a municipal system is legally allowed to release semi-treated sewage into a water body. These overflows typically occur when a system is overwhelmed during a heavy rainstorm, and differ from spills, which are unplanned. Two weeks into the new year, one Vermont wastewater system has already dumped thousands of gallons of untreated sewage into state waterways. The Vergennes wastewater treatment system discharged 12,700 gallons of untreated sewage into Otter Creek when a mechanical failure caused a pump station to overflow. City workers manually operated the pump on Sunday into Monday, when an electrician was able to fix the pump. Gov. 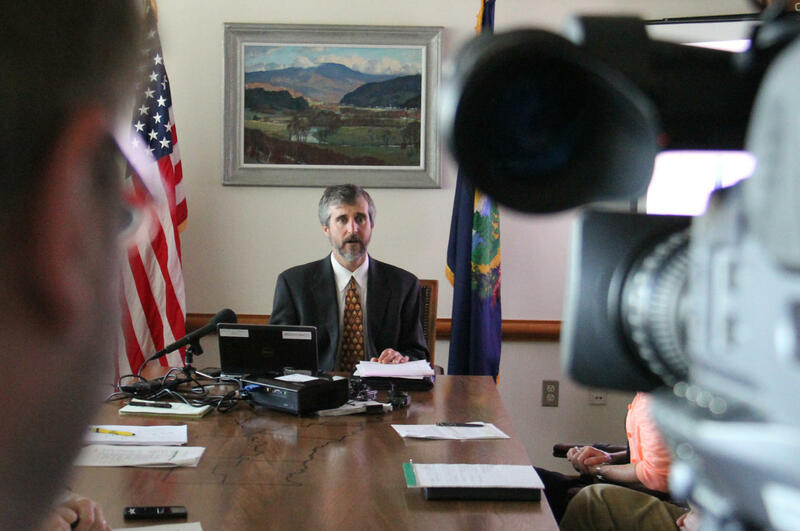 Peter Shumlin signed a new clean water bill into law on Tuesday. In the past, Vermont has focused on cleaning up Lake Champlain, but this legislation targets lakes, rivers and streams throughout the state, including the Connecticut River. And the impact of the law may be felt well beyond the state's borders. As the state prepares to set a new course for Lake Champlain cleanup, wastewater treatment plants across Vermont continue to dump millions of gallons of polluted water into Lake Champlain and other waterways. Most of the plant operators responsible for the unauthorized releases aren’t penalized in any way. “There’s no question that all of the sewage treatment plants in Vermont, at least in the Lake Champlain basin, are going to have to do more to reduce phosphorus levels,” said David Mears, commissioner of the Vermont Department of Environmental Conservation.